Prequel: Digimon Adventure: Bokura no War Game! Storywise: The storytelling is not bad, but much has changed, including the pace; Digimon Adventure had 5 story arcs, each 10 to 14 episodes long, which allowed it to move at a pace that never felt too quickly or too slow, each arc started and ended properly. Here... not su much; we have 3 story arcs, one of 21 episodes, then one of 17 and the last one of 12 episodes. We find some filler episodes in the first one, some ongoing character problems on the second (I'll fill that in the next section) and a rushed and convulted final arc that tries to make up for what is kind of a lagging season by bombing us with too much material that never gets developed (Demon, for instance). Now, don't be fooled; despite all its flaws the storytelling is still enjoyable, there are still mature themes around and the air of greatness of Digimon Adventure, however the flaws are too notorious and the characters also dragg it down, but I have to admit that they are all thought through, none of them comes out of thin air (give or take the final arc) and they all get somewhat their propper ending. The plot is not as good as the first Digimon series, but the potential is there. Now, why wasn't it fully used? Mainly, characters problems. Character: Here is where Adventure 02 just outright failed. Remember how amazingly outlined the characters from the first Digimon series were? Remember how they were just broadstrokes that got developed into fully fleshed out character and how amazing was that the crest of each character represented the very scent of how they were? Well, Digimon 02 mainly hopes you forgot about all that. We still have our main 8 characters from the first series, but 6 are downgraded to supporting roles, while 2 remain and 3 new character join (one more joins lare on). Now these 3 characters are the main trouble of Digimon 02. Daisuke (aka Davis): he is arrogant, he is reckless, and he is a good guy deep down, we have our most stereotypical hero! Of course, that wouldn't be a trouble with the propper character work, but here there is... none. There is no background to explain Daisuke's personality, whereas in Adventure we had backgrounds for each character. We know he has issues with her sister, but that never gets developed (not to mention we never get to know his parents). As the series goes forward Daisuke changes and matures, for no apparent reason; granted, being in the digital world fighting monsters does change people, but Daisuke's change really came without propper building up. He passed from annoying to tollerable, but mainly he was just plot fodder. But he is not nearly the worst character. Miyako (aka Joley): now here is a character that mostly everyone will hate! Why is that? Miyako is all talk and no action. She is energetic and sometimes you picture her as the optimistic one, but as soon as she get into the real danger she freaks out and it takes her about 5 minutes of screen time to realize she has to fight. As the series progress her character is mostly ignored and she is left with her characteristic energetic self and food lover life personality, with no development whatsoever or any background at all. Iori (aka Kodi): Want someone as annoying as Miyako? Iori might be the one. He is rigid and barely makes an expression, if any. Unlike the previous two, this character does have a background which is not only in sync with his personality, but actually linked with the final arc and despite being kind of interesting, the character himself remains the same for about the whole show, with no actual changes and nothing more than his usual poker face. Takeru (TK) and Hikari (Kari): They came from the previous series, so everything should be ok, right? Sadly no; both Takeru and Hikari are mainly ignored in this series. Takeru has about 3 good character moments in the show in the first arc, and then acts as plot fodder later on. Hikari is... well, I wouldn't know, she really doesn't fullfil any function here, give or take going to the dark sea world or supporting the rest on battle. Ken: Here is a character that actually got good treatment; he is given a nice background which is consistent with his personality, he is conflicted, and while shy he is mainly likeable for showing the brave to move forward and attone for his wrongs. He is the only one that actually gets good character moments and a character arc that is mainly involved in the plot. Sadly 1 out of 6 doesn't make the cut for good character treatment. Music: Gladly, the OST from the previous series remains here with the addition of some more tracks made just for this one, which are good. The opening theme, while not as amazing as the one seen in Digimon Adventure, is actually pretty good, both endings are also good, and the tracks that plays in the new evolutions moments are quite nice (specially the one when jogress evolution is made). So, yeah, still a 10 if you ask me. 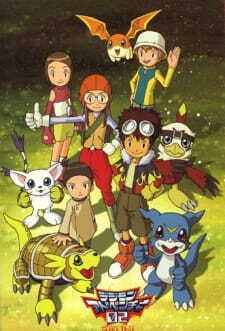 Enjoyment: For all its faults and failures in the character department, I still think I like this Digimon series. It has some very bad moments that made me ask myself "why am I watching this crap?" Followed by some very glorious moments that kept me on the edge of my seat and reply "Oh, yeah. That's why". Sure, if I had to grade each episodes, most of them would be on the range of C to B-, but there would surely be straigh As in the ways, but sadly some Ds or Fs too. As a whole, the enjoyment is fair: you get some very clunky, cheesy and boring moments, but you also get profounds and exciting ones (thank you BlackWarGreymon! And Taichi and the rest too for that matter), and as such the enjoyement is in thin line between fair and good. -Did you know that originally Adventure 02 had 64 episodes, but the order got cut to 50 somewhere around the way because of low rating? Now we may understand why the finale felt so rushed. -Demon (being sent to the dark world in episode 45): "you'll regret this". Apperantly this was set up for Digimon Adventure 03, which you know ended up being tamer so... no, they never regreted it. Besides, what was his purpose in the first place? We'll never know. -Ken (in episode 42): "por favor déjeme entrar" Ken, tu español no es malo, de hecho mejor que el de mucho japoneses, pero no deja de ser raro escucharlo. -Best character: BlackWarGreymon, surely, as he is a sympatetic villian at first and then a tragic hero. His arc is also the high point of the series, as he wonders for the meaning of life; he surely got the best character treatment, closely followed by Ken. -Worst character: Miyako, surely, clossely followed by Iori. -Daisuke (in the finale) "I want to have a ramen shop!" Ken: "I never knew about this". Nobody did Ken, and nobody even cared. -Award for most forgotten character from Adventure: Mimi, somehow the writers though sending one of their most developed characters into USA would make the cut. They were wrong. Also, I think Sora was pretty much forgotten too. Next up: How Digimon Tamers triumphed by denying it had a past! No matter how you look at it - you'll compare it to the first season. Where the first season had 8 original characters, all with an amazing background, unique in every way, this series simply does not have the same amount of effort put into it. Daisuke is even bolder than Taichi was, to the extent of you wanting to smack him in the face. Big time. The same with Veemon. He's like Daisuke, and thus, annoying as hell. Didn't grow to either one of them. As for Miyako - wow. She's even more annoying. She's that one girl that nobody really hates, but has no real friends around her either. Comes from a family that runs a convenience store. Not really much to add here.. her Digimon is okay though. Iori. Iori, Iori, Iori-kun.. back then, I thought Takeru was a crybaby and rather holding the team back. But this guy? Wow. His Digimon is somewhat okay, he reminds me a bit of Tentomon, but a little more childish and adding -dagyaa behind everything he says. Takeru. Takeru sure has grown up. He's gotten used to fighting, protecting people, he's someone you can rely on. Patamon hasn't changed either. Both in a good way. Hikari still is the same sweet girl she was back then, only a little bit more mature. Back in Adventure, Taichi said that "she was a person that really didn't care for herself, always sticking out for others". That quality seems to have been flying away in this series. Even though that's the case, she's still likeable. Ken - well. I don't like him. Imagine someone torturing all of your friends, to the extent of almost dying, and then having him join your team because he was crying in a desert. Yeah. THAT kind of guy. Well, yeah. A Chosen Child that thinks Digimon are just "data"-segments that have no feelings, and thus abuses them? With evil rings? And with a whip he hits his partner with? Okay. The story after the Digimon Kaiser-era (which took up 25 episodes if I'm not mistaken) grew a bit. Not a lot, just a bit. I immediately resented the bit where Veemon came out of his Digimental, and instantly knew what to do. "YELL DIGIMENTAL-UP YOU BLOODY IDIOT, I DON'T HAVE ALL DAY!" is basically what it came down to. Where the original series was about the actual adventure, finding out what to do, where to go - this series has it all laid out before them. It was still okay. Not that impressive, but good considering what year it came out in. Design of the Digimon.. well.. to be honest, I quite resented the Pegasus/Sphinx types that Patamon and Tailmon Armor-Evolved into. BlackWarGreymon and Parrotmon were Digimon that shouldn't have been introduced any further. Parrotmon had its charm because it was, well, just there when the original Digidestined saw it fight. Remember how in the first series Digimon died all over the place? They wiped out Devimon without a second thought. That happened in the 13th episode. In the new series, the thought of having to "destroy"/delete Digimon, first occured in episode 40. And even then, when it finally came down to it, all new Digi-destined didn't like the idea. Honestly, someone is trying to kill you, but hey, let's not try to kill him back? That annoyed the hell out of me big time. I still give the series a 7/10, mainly for the reason that the old Digi-destined (Taichi, Yamato, Sora, Jou, Koushiro and Mimi) were having a well formed role throughout the whole series. Don't get me wrong - if you've watched the first season, I highly recommend you watch this one, just don't get your hopes all the way up. Compared to the first season, this second season of Digimon Adventures is a step down in quality quite heavily. With exception to Ken, the new characters lacked the depth and problems that the first season kids experienced. This is especially a problem with new kid Davis, who is portrayed as a hot-blooded act-before-thinking boy who doesn't get much fleshing out nor any problems that he must overcome thus making him feel quite shallow as a character compared to much of the main Digidestined. The sad part is that Davis is made the leader of this generation's Digidestined, for better or for worst. The older members of the first generation Digidestined are shafted to supporting roles whose their only roles in this series are to aid the current generation in explaining or advancing parts of the show's plot. About the only kudos I can give for characters in this series comes from Ken's developments where we learn of his tragic past and his efforts to reform by joining the Digidestined. The plot for this series isn't much better off either. Digimon Adventure 02 has a more light-hearted mood with nearly half of it focused on the Digimon Emperor arc and having a decent amount of filler. While the idea of the Digidestined taking on a human threat is a unique approach to this series, Ken's not as convincingly threatening as early villains like Devimon and Etemon since we seen the stakes faced by the Digidestined raised higher in each later arc for the first season and many of the villains weren't hesitant to take lives. Things got a bit too scaled back with convincing threats in this season. The large length of the Digimon Emperor arc actually causes problems for developments in later episodes of this season as the show tosses in multiple plot developments that are either sloppily introduced, abruptly resolved in the span of a few episodes or rushed through to seemingly force the series to another desired point in its plot. The series also suffers from wasted potential in what it could have introduced or expanded upon with several plot elements that were tossed in such as the Dark Ocean, Kari's unique powers and the Daemon Corps. Regrettably, these plot elements were instead just tossed in as filler and either were never focused on again or were quickly brushed aside. It looked like this season wasn't sure what kind of plot it wanted to deliver with how its later episodes are all over the place with developments. I don't even want to get started with how the series pulls off its final three episodes that reveal who the true enemy threat is and the abrupt happy ending it plays up. Otherwise, the visuals and other aspects to the plot are about what you would expect of generic titles: average artwork, reused animation clips, plain character designs, the run-of-the-mill 'evil' Digimon villains, Digimon being beaten to a pulp before their partners gain the power within to defeat villains and so forth. Even if you're a Digimon fan, I wouldn't waste my time trying to look into this second season to Adventure. The Digimon Emperor arc got too dragged out thanks to having several episodes worth of filler and this results in later episodes being a mess with their developments thanks to having several plot threads being tossed around that are awkwardly handled in their resolutions. Not to mention that other than Ken, the new Digidestined children lack the solid depth and development that the first-generation group underwent in their ordeals. You could watch just the first season of Adventure and you could just pretend this one was never made. Digimon Adventure 02 is the secound edition to the Digimon series..
as the series takes place with some of the same characters from the previous season.. While only two of those now remaining the main characters..
As time goes by and after alot of research the Digidestined have managed to find a way back into the digital world Through using the School computer.. but as yet another couple of years has passed the Digiworld now has yet another huge enemy and a big threat. A Normal human being has managed to get into the digital world and is causing a ruckus.. This boy is the Digimon Emperor and he is building black spires everywhere in the Digital world.. as he will be hard enough to defeat on his own these spires makes it even harder as the digimon will no longer be able to digivolve as they used to. As the series goes on it will come with new twists and challenges. it will be a change in the story that noone will be able to see coming.. And a couple of new characters will be introduced.. If you are a fan of The previous Digimon anime you should be sure to check this sequel anime out. If you are yet to see the first one though, There are things you need to know from the prequel before you see this one.. The human mind can only take so much before it just snaps like a twig. When that happens people can have different reactions, from breaking down and crying to going on a killing spree. One bad day can be the tipping point that forever changes a person for better or for worse.